Most people can agree that the guitar is a pretty cool-looking instrument. But when it belongs to a world-renowned musician, has toured the planet, and has the scratches and dents to prove it? Even cooler. That’s exactly the premise behind 108 Rock Star Guitars, and it’s a pretty neat idea indeed. Created by photographer/author Lisa S. Johnson, who now photographs guitars exclusively after a ten-year stint at Eastman Kodak, this bible of sorts features almost 500 full-color portraits celebrating every nook and cranny of the some of the world’s most iconic six-stringed beauties and the players who play them. Custom paint jobs, faded initials, belt buckle scratches, or flat-out gashes are the prime focus of the images, and truly give each guitar its personality and flavor. The fact that many were taken on the fly backstage in dressing rooms or on top of a road case somewhere in Indiana gives each story—and the book overall—its character and charm. Weighing in at almost 400 pages, the book showcases one amazing instrument after another, each representing such legendary players as Joe Walsh, Carlos Santana, Slash, Johnny Winter, Ronnie Wood, Willie Nelson, Joe Satriani, Tom Morello, and dozens of others. 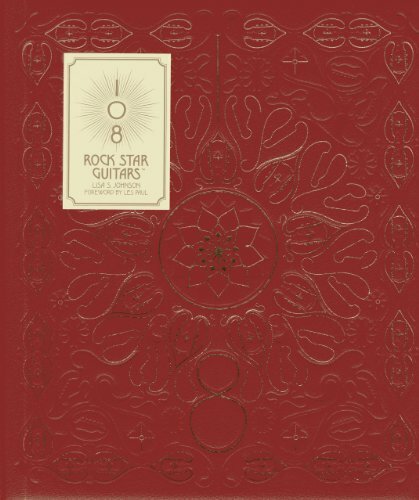 Six glorious pages dedicated to Jimmy Page’s legendary Gibson SG double-neck (the “Stairway to Heaven” guitar, in layman’s terms) make a tome like this a must-have for any true guitar nut, let alone a Led Zeppelin fanatic. That Johnson was mere inches from such a musical beast is precisely the moment one realizes what a remarkable project this truly is—one that took 17 years, amazing persistence, and some serious traveling. Although folks like Eric Clapton, Keith Richards, and Jeff Beck are household names, when digging deeper with skilled but lesser-known players such as Porl Thompson, Reeves Gabriels, or even Dave Mason, some extra information would go a long way. Regardless, the beauty of their instruments—and how Johnson chose to photograph it—is what permeates the pages (even if images of the artists themselves sometimes feel sorely missing). A few of the portraits are so close and abstract (although clearly intentional) that it’s hard to make out exactly what we’re looking at, which almost does a disservice to the instrument. Still, everything is laid out beautifully, capturing every personalized guitar strap, worn-out pick, or sound-hole inscription in all its ragged glory. This is a labor of love times a hundred, and it’s impossible not to appreciate that, even if only a portion of the audience will get through each and every page as thoroughly as the author hopes (including how the photo session came to be, where and when it took place, etc.). Why the artists are not simply organized alphabetically is probably the only detail overlooked in an otherwise meticulous display. Originally released in 2013 in hardcover, this softcover edition is now available at a more affordable price without sacrificing much at all in the way of aesthetics, as the colors and texture of the cover alone tell the reader they are in for a spiritual journey that will inform and inspire. A foreword by the late, great Les Paul—whose personal guitars and those bearing his moniker are featured in many of these pages—lends a touching stamp of approval that guitar aficionados will appreciate before they even get to the good stuff. A portion of the proceeds also benefits the Les Paul Foundation, which supports music education, engineering, innovation, and medical research. Would 100 Rock Star Guitars be a catchier title? Of course. Would 50 Rock Star Guitars or even 75 have been a tad bit more concise? Definitely. (The author explains her connection to the number 108 in the book’s intro.) But it would have been far less colorful, not nearly as comprehensive, and most importantly, would have cut Johnson’s message short by sharing only part of her nearly two-decades-long journey. Plus, any book that has close-ups of Ace Frehley’s smoking Les Paul is one I’m proud to have on my shelf.